Manchester has many things, but it doesn't have a listings magazine. 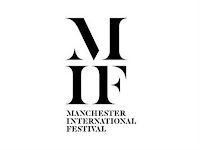 Online, there are plenty of places to look to for cultural inspiration, including Creative Tourist, Manchester Wire, and enough good blogs to choke an eGoat (see sidebar). But since CityLife folded in 2005 and Time Out wussed out in 2007 we haven't had a proper listings magazine. Well that's all going to change soon: we're getting one. Well, half of one. We have to share it with Liverpool. You know, that other city a scant 36 miles away. The conventional media wisdom (only reinforced by the failure of the Northwest Enquirer a few years back) goes that these two cities are so irrecconcilably different they must be kept apart at all costs, and will respond negatively to any attempts to lump them together. Kind of like Edinburgh and Glasgow. So who better to conquer this job than the publication that has successfully covered both those cities in one publication for seven years? 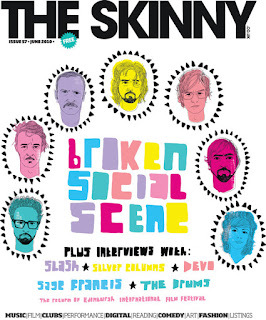 Yes, The Skinny is setting up a Northwest edition. They've been flirting with the idea for the last couple of years, but now it's official: they're hiring a staff and will be publishing both online and (take a deep breath) in print starting in April. They've lined up Lauren Strain to edit the magazine and are recruiting over here on The Skinny site, with a few positions up for grabs including a subeditor and section editors for books, visual art and comedy: some paid, some not. It will be run from offices on Tariff Street in the Northern Quarter, which will probably put some noses out of joint at the other end of the M62, but they were never going to please everybody with that one. 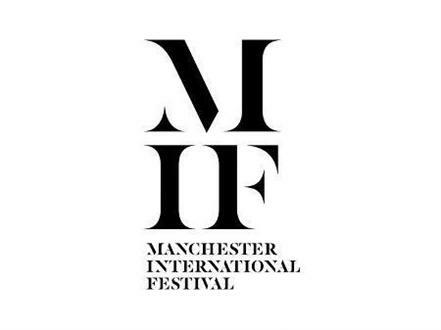 It seems like every week I get a email about a new website that will be covering Manchester (the latest is Wow247 which asked me to pick out some fun things to do in Manchester the other day). So I doff my fedora in The Skinny's general direction for taking a chance on print in this city. Now let's all try to read the thing, shall we? Or we won't be getting another one. Just a quick post to pass on the good news that Manchester city centre is soon to get its first playground thanks to the folks at CityCo. The lack of a dedicated outdoor play area in central Manchester (and the lack of green space generally) has long been a concern of mine; see previous rants here last year and here in 2010. Yes, expanding green space is a tough sell when city centre land is worth so much and everyone from the council on down is hard up for cash. But parks make this city a much more attractive place to live and work. Navigating the city centre with small children can be a challenging proposition. In the part of Manchester where I live, just 25 minutes outside of the city centre by car, many of the parents I talk to rarely take their kids there, maybe a few times a year for a panto or a big shopping trip. We go a lot more often than that, but mostly our strategy is get in, do what we need to do and get out as quickly as possible. It's easy to understand why. Indoor play is mostly limited to galleries and museums (hats off to the amazing and free Experiment! at MOSI) and any special offerings are usually busy and often require planning ahead. 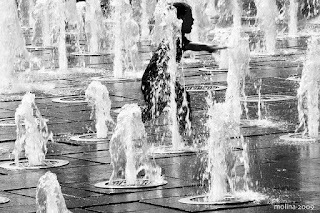 And with little outdoor space to roam about in, kids make the most of what there is, as a visit to the fountains of Piccadilly Gardens on a hot day will attest. Just having a place like this to go will be a big help. I noticed the new playground when I was walking to Victoria Station this week. The new street-shaped park will be installed on the riverside in front of Manchester Cathedral, and will effectively create an extension of Cathedral Gardens. Really looking forward to taking my own kids for a play there this spring. Now we just have to keep people from wrecking the place. Hmmm. In the meantime, can we please have a Playful Leeds in Manchester? We like to have fun here too. Image by Lucho Molina via Flickr.